I didn’t question my decision to start my MBA with an infant – I just did it. I am almost one year into the program and can confirm that it is possible to “do Booth with a kid.” I don’t think it is significantly harder than being a working mother – if anything, the flexibility that Booth provides enables me to go to school, recruit, and socialize while coming home in time to put my son to bed. Practically, how does one do it? First, I am very thoughtful with my schedule. While I skipped the (in)famous Colombia trek and rarely go out for drinks with everyone on Thursday nights, I find time for everything that matters to me, whether it’s Booth programming or bath time for my son. Second, constant coordination with my spouse and setting expectations about the intensity of the program. This allows us to co-parent while simultaneously making these two years productive for us both. We also find time for family exploration of Chicago (one of our favorites is Maggie Daley Park which is 5 minutes away from our apartment in the Loop). Lastly, having a strong support network with my Booth peers is crucial. My study group teammates have been supportive when my childcare failed. I had to spontaneously bring my toddler along and allow him to crawl around on the study room carpet while we went through an assignment. We host friends for dinner while our son sleeps in the room next door and appreciate the Booth network (and partners) for babysitting when we want to go out. 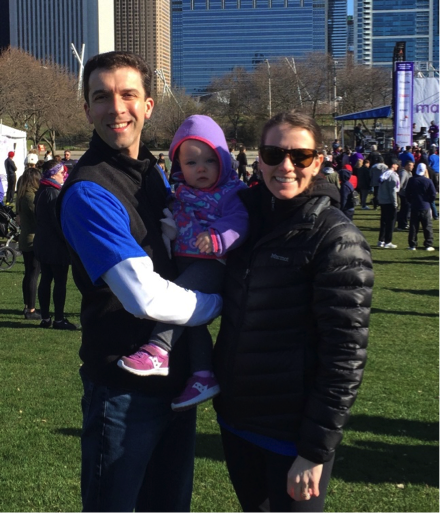 Between motherhood, relocating from Israel to Chicago, and starting my MBA at Booth, this year has been full of new experiences. Beyond proving to myself that it is possible to both parent and study, I found coming here with my family to be extremely rewarding for all of us. In our featured image above, Inbar and husband Joel show off Ethan’s Booth pride in the Winter Garden. My husband and I came to Booth as a married couple, so I knew that our MBA experience wouldn’t feature as many crazy Thursdays as those of our single colleagues. But add a pregnancy (and baby!) to that, and I can say that I have had crazy of a different kind. My 3am runs to 7-Eleven don’t feature Gatorade and stale hot dogs, but Haagen Dazs with salt & vinegar chips. I’m fortunate to have a deep support system of family, friends, and school advisors who have helped shape my final year – and pregnancy – into an exciting and memorable experience. With planning, Booth’s flexible curriculum allowed me to take a reduced load in my final quarter to spend full-time with my daughter. Advice and support from Careers Services, Student Life, and the Office of International Affairs optimized my strategy to make the most of classes, keep up with my student group co-chairing, and maintain my social life. The close-knit Mothers At Booth group was indispensable for answering all my silly questions, offering advice, and just being there for this first time mother. But with it also comes the need to balance and sacrifice. My MBA memory won’t come with the Ski Trip, Wine Club events, or Pricing Strategies (yes, I am leaving Booth with my 17k bid points in tact). It will come with more sleepless nights and visits to the doctor. But I wouldn’t swap this experience for any other. Dual Boothie couple Liz and Cosmin Tudor show off Olivia, the newest addition to their family. 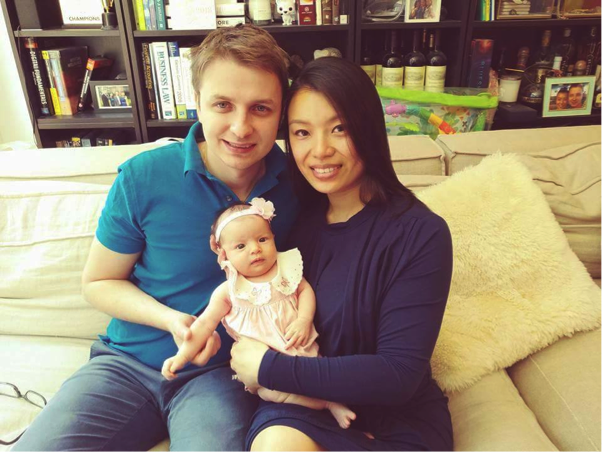 I started Booth’s Full-Time MBA program when my daughter, Grace, was 10 months old. When choosing an MBA path, I did a lot of soul-searching and decided that my aspirations to start a family and get an MBA from a top school were not mutually exclusive. My day-to-day routine may look a little different from most of my classmates, since I build in time for things like daycare drop-off and bath time, but my Booth experience is still robust and rewarding. Some things about business school are the same as if I didn’t have a family, like group project meetings, class, and grabbing coffee with classmates. But, some things are different, like opting out of evening social events or campus speakers when my toddler is sick. As a parent, I have a set of priorities that guides how I allocate my time, and I’d be lying if I said it was always easy to decide how to spend my time, or that getting my family fed and homework done was always simple. Given what I know now, if I could go back and choose a different path, I wouldn’t have it any other way. Later this year, we’ll welcome our second daughter to the family and experience the challenges of two kids under two, but nothing drives me more than being a role model for my kids, and I know the Booth experience will set me up for success in that regard. Megan, her husband Greg, and Grace enjoy a stroll through Millennium Park. If you’re thinking of starting a family during your MBA, then know that you can do it your way. Having the right support system around you is invaluable and managing your priorities is a must, but ultimately, the experience is worthwhile and memorable. Wishing all mothers a Happy Mother’s Day with lots of kisses and cuddles from your little one!